8572: Our client in North Iowa is looking for an Electronic Maintenance Technician to perform electronic installation, troubleshooting and repair. Employee will also need to repair, install, and maintain plant facility utilities and equipment. Install and maintain all electronic process equipment. Install new equipment per specifications. Perform preventive maintenance by referring to equipment manuals and established past practices and procedures. Maintain, repair and upgrade utilities including air, water, electricity, heat and refrigeration systems. Maintain, repair and upgrade plant facility. Operate all equipment and tools as needed to accomplish assigned tasks. Assist in writing preventive maintenance procedures for plant equipment. 2 year AA degree in Electronics Technology. Prefer hands-on PLC programming and troubleshooting skills. Experience with Allen Bradley controllers is desirable. Scott joined the City & National team in June 2013 as a Recruiter in our Engineering department. Scott has his Bachelor’s Degree from Central College in Pella, IA in History and has built a profile complete with sales, business development and management experience from past positions. Scott has over 10 years of management and sales experience, working with many different clients and prospective leads. 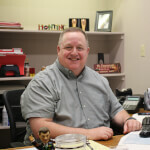 His strong interpersonal, communication and relationship building skills will contribute to great success here at CNE.